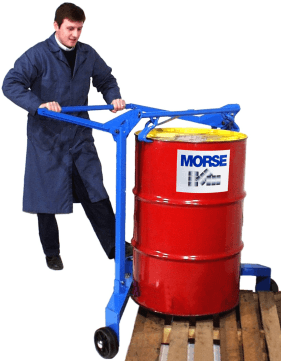 This innovative drum handler is designed to easily move a rimmed 55-gallon drum (210 liter drum) onto and off pallets up to 6" high. Watch the video to see this ergonomic, simple-to-use, and economical way to transport drums around your facility. Drum Spotter - Drum Palletizer - Innovative drum handler designed to easily move a rimmed 55-gallon drum (210 liter drum) onto and off pallets.